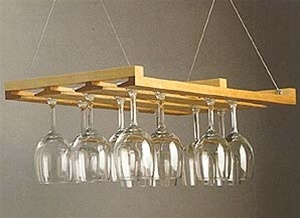 Truly a mixture of old and new, our hanging stemware is suspended by hi-tech steel aircraft grade cables. The stems hang in 3 rows with access from both ends. Peg-stops in the middle of each row prevent glasses from pushing through and off the end. The rack will hold 18 to 24 stems (max 3¼" diameter base). Oiled finished hardwood. Easy to install with hardward included.